What Congressional Districts Have the Most and Least People with a Bachelors Degree? You are at:Home»Special Projects»Politics»What Congressional Districts Have the Most and Least People with a Bachelors Degree? I recently created a data visualization that showed that there wasn’t a strong relationship between political party preference and education attainment. While that relationship didn’t exist. It is still important that people know how educated the populace in each congressional district is. 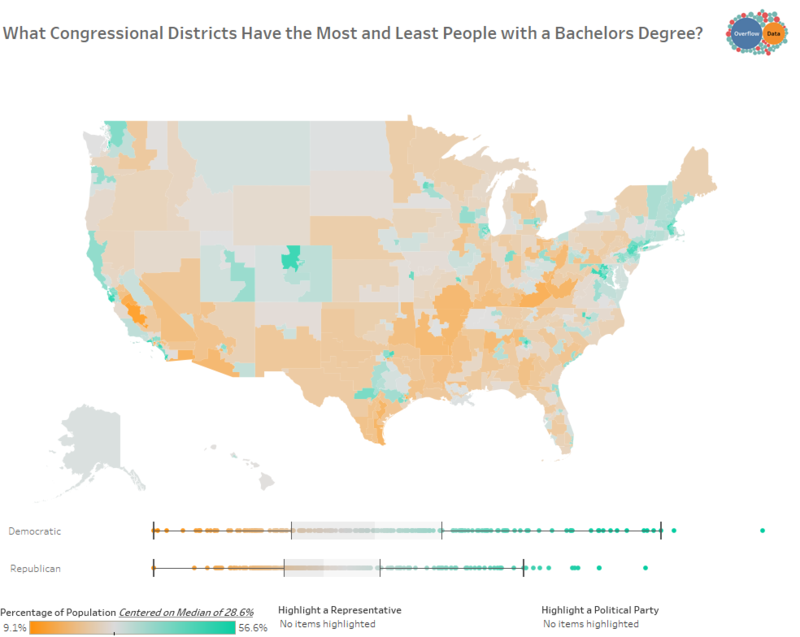 To illustrate this, I decided to use Tableau to create a visualization that shows where what congressional districts have a higher than average number of Bachelor Degree holder and which ones have a lower than average number. The visualization represents data I gathered from the Census Bureau’s API for the 2015 American Community Survey.